There are several subspecies of the boa constrictor (with the species name boa constrictor) that are found in the pet trade. Red-tail boas (Boa constrictor constrictor) and Boa constrictor imperator can be commonly found in the pet trade among other less common subspecies. The care for all these species is fairly similar. Before committing to the ownership of a boa constrictor, be sure you will be able to handle the size and strength of a full grown snake for the 25 to 30 years they might live. While generally quite docile in temperament, it is important to respect the inherent strength of these animals and that they could inflict. Captive bred reptiles are generally more healthy and docile than wild caught counterparts. Boas from South America are slightly more aggressive and may hiss when they feel threatened. In general, boa constrictors are solitary snakes. While baby boa constrictors can be housed in glass aquariums, larger snakes will need a custom enclosure, either commercially purchased or constructed at home. Boa constrictors are very powerful and will escape if given the chance, so enclosures must be very secure. The cage size for an adult boa constrictor is around 6 to 8 feet long, 2 to 3 feet wide, and 2 to 3 feet tall. The minimum is about 10 square feet of floor space (for a single snake). The cage should be easy to clean and you must be able to maintain high temperatures in it. Hides are essential to make your snake feel secure and a minimum of two should be provided in the enclosure, one at each end of the temperature gradient. Hides can be half logs, commercial reptile caves, upside down plastic containers with a hole cut in the side, or even cardboard boxes. Make sure they are not much larger than the snake, as a close fit will help the snake feel secure. They should be cleaned or replaced in the case of cardboard boxes when they become soiled. 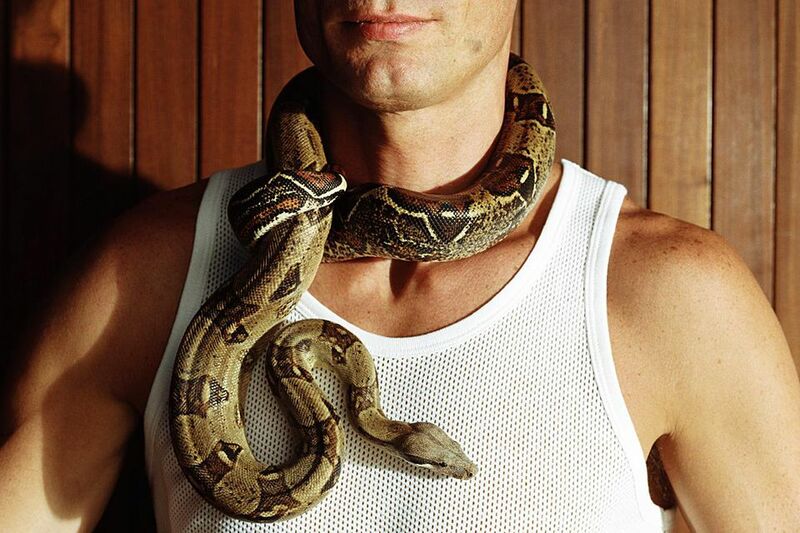 Boa constrictors come from tropical climates so warm temperatures in their cages are essential. During the day, a temperature gradient between 82 to 90 F (28 to 32 C) should be maintained. In addition, a basking spot of 90 to 95 F (32 to 35 C) should be provided. At night, temperatures can drop to 78 to 85 F (26 to 30 C). The temperatures in your snake's cage are critical, so accurate thermometers with measurements in several locations of the cage (warm end, cooler end, basking spot) are a must. A combination of incandescent bulbs, ceramic heating elements, and heating pads can be used to maintain the temperatures. Any bulbs or heating elements in the cage must be shielded to prevent burns, to which snakes are quite susceptible. Hot rocks should never be used. The humidity level can usually be maintained with a large bowl of water in the cage and a heat source nearby will cause evaporation to increase the relative humidity. The snake will likely climb into the bowl for baths, so make sure it is sturdy and big enough. It should be cleaned regularly and snakes will also often defecate in the water so keep a close eye on the cleanliness of the water. Shedding snakes can especially benefit from a bath to aid in the natural process. A variety of substrates can be used in boa constrictor cages. For young snakes, lining the cage with paper or paper towels is the best option for easy cleaning. For adults, paper can also be used, as can something like indoor/outdoor carpeting. The benefit of carpeting is that two or more pieces can be cut to fit the enclosure and a soiled piece can simply be replaced with a spare while the soiled piece is cleaned and disinfected. Reptile bark can also be used, although it can be more expensive. The use of wood shavings is probably best avoided due to irritation concerns and the potential for accidental ingestion and impaction. A cleaned and sterilized tree branch heavy enough to support the snake's weight should also be provided in the cage. Soak it in a bleach solution, rinse it very well and dry it thoroughly before adding to the cage if you got it from outside. Otherwise, store-bought driftwood can also be used. As a rule, younger boas should be fed more frequently than adults. Smaller snakes can be fed every 5 to 7 days, intermediate snakes every 10 to 14 days, and full grown snakes every 3 to 4 weeks. Feeding should be adjusted to maintain a good body condition in your snake. Keep in mind that many snakes in captivity are overfed so obesity can be a problem. Hatchling snakes can be fed mice and rabbits (one per feeding) as they grow larger. An adult boa constrictor will eat a few rats for a meal or one rabbit every month. Never feed a snake a prey item larger than their widest body part. Avoid handling your snake for at least 24 hours after a meal, or regurgitation might occur. Generally, boas like to hide with their prey to eat it. Don't be surprised if your snake disappears into a hide box with their meal and you don't see them for awhile. It is a good idea to feed snakes in a separate enclosure away from their home cage so that they only associate feeding with that location if you have the opportunity to do so. Feeding time is when the most care is required for handling boa constrictors (as with any other snake). Do not feed by hand, as it increases the risk of accidental bites, and wash your hands well after handling food, or the snake might strike at your hand. A handling stick can help push the snake away from the cage door at feeding time to help prevent problems. The most serious disease that can affect boa constrictors is known as inclusion body disease, or IBD. This is a fatal retrovirus, similar to HIV in humans. It's possible for an infected snake to appear healthy as the virus can lay dormant for several years. Housing your boa constrictor in separate enclosures from other snakes is a way to prevent the spread of IBD; it can be transmitted from snake to snake via mites, which carry infected bodily fluids. Symptoms include a boa breathing with its mouth open, poor appetite, and excessive amounts of saliva. In advanced cases, IBD causes snakes to lose control of their bodily movements. Boas are also susceptible to respiratory infections. Most of these are caused by insufficiently heated enclosures and are easily treated. The signs of a respiratory infection include wheezing, nasal discharge and a snake holding its head up for long periods of time. If you see a foamy substance coming from a boa's mouth, this is a sign of pneumonia and requires immediate treatment. Both of these skin conditions require treatment by a specialist. As with other reptiles, owners should choose a captive bred specimen. Captive bred reptiles are generally more healthy and docile than wild caught counterparts. All boa constrictors fall under CITES (Convention on the International Trade of Endangered Species) and are listed in CITES Appendix II (threatened in their native habitat). Boa constrictor occidentalis is on CITIES Appendix I - endangered - and requires permits to buy and sell. Boa constrictors breed fairly readily in captivity. Otherwise, check out all of our other snake breed profiles.